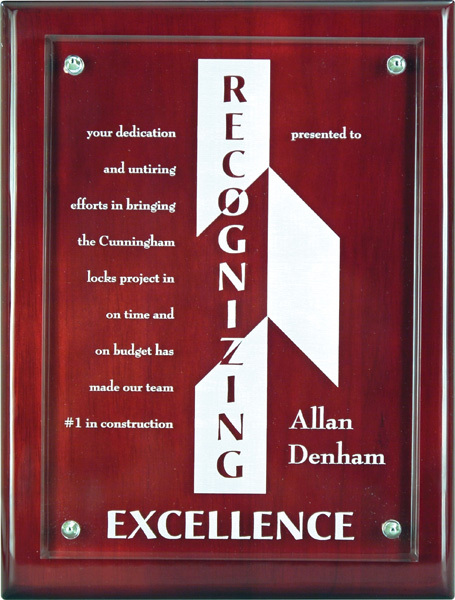 P510A - Annual Cherrywood laminate plaque with 12 postions for recipient plates. Price includes engraved header plate. With Full colour sublimation logo and black text on brushed gold header plate. 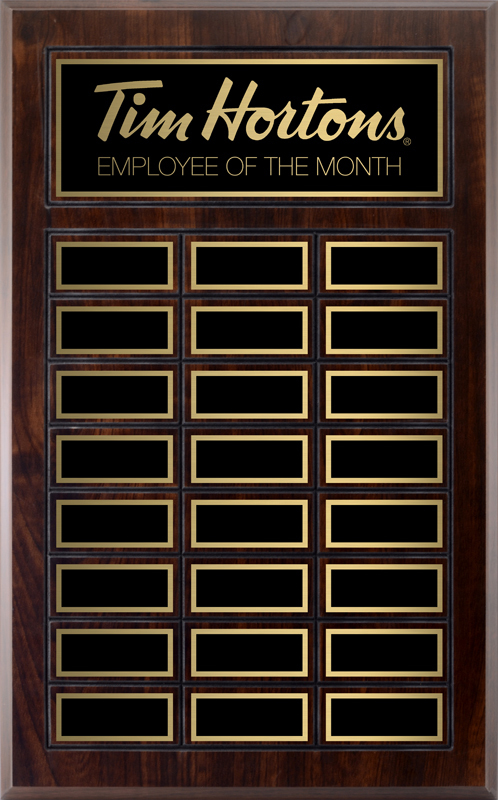 P510B - Annual Cherrywood Laminate plaque with 18 positions for recipient plates. Size 12 x 16". 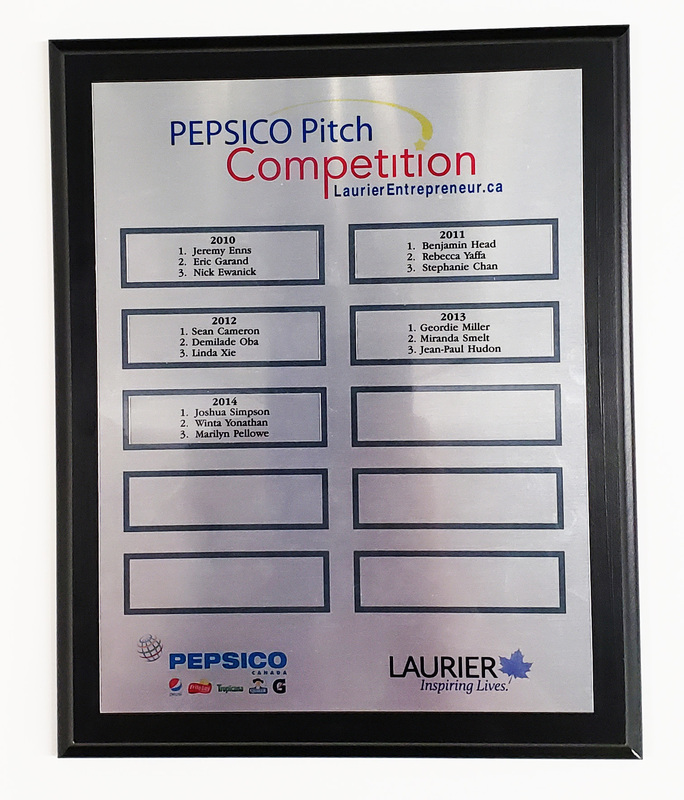 - Price includes engraved header plate. 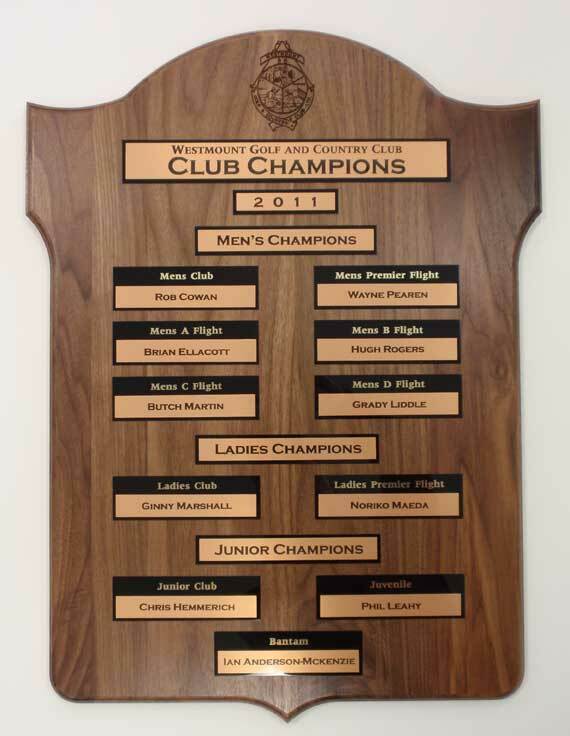 Your choice of Black Brass, Gold or Bronze engraving plates. 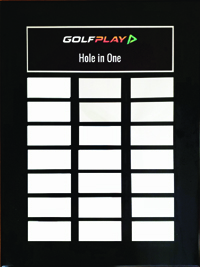 P510C - Cherrywood Laminate plaque - 24 positions for recipient plates. Price includes engraved header plate. 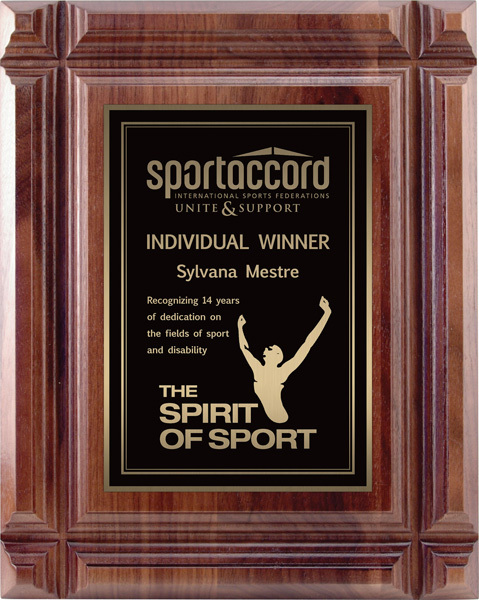 Size is 12 x 19" Your choice of Black Brass (shown), Gold or Bronze engraving plates. 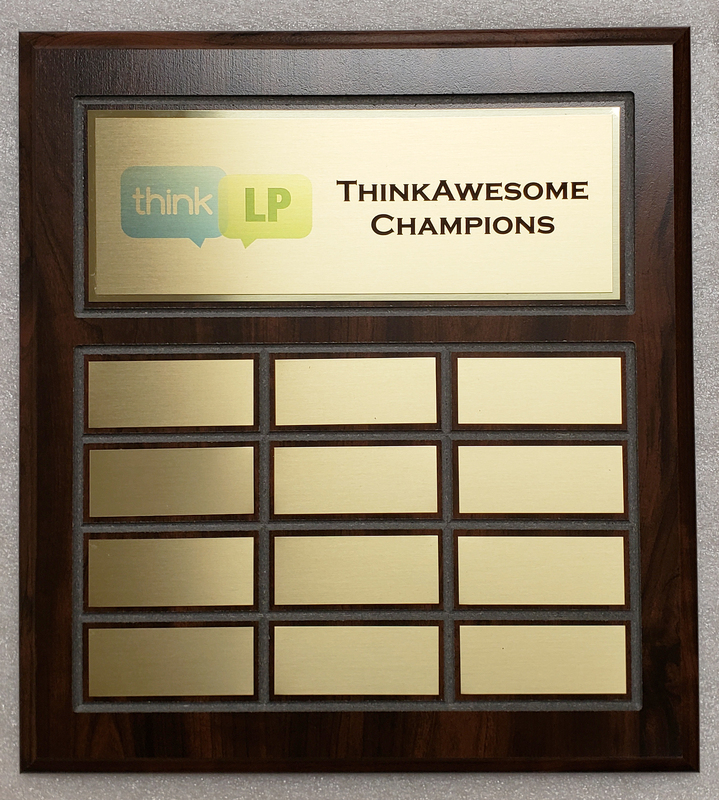 Large W7 Annual Plaque 18 x 24 "
P25E - 18 x 24" Solid Walnut Shield annual plaque. - Can be custom laid out to your specifications with choice of engraving materials. Direct laser engraving into wood is also an option. Will provide layout proofs and quote. 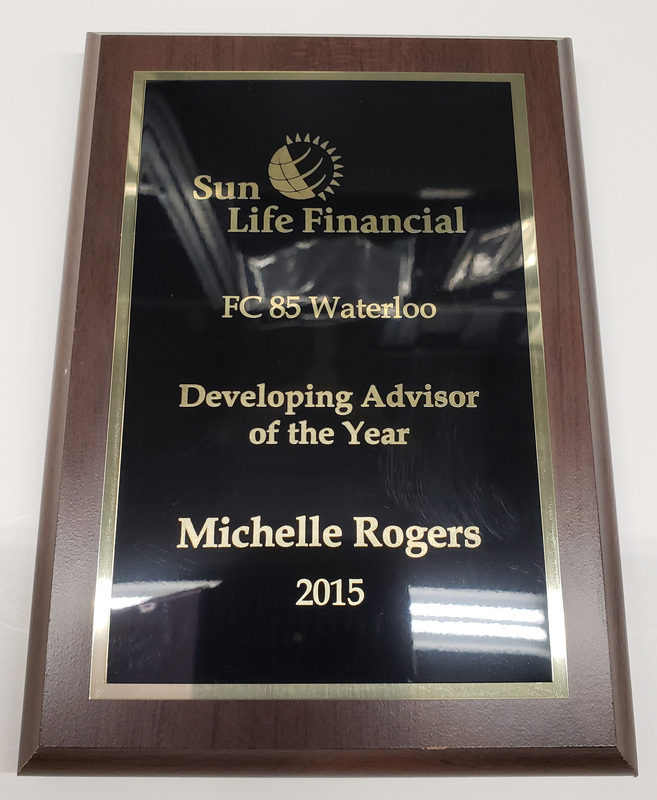 Sample Cherrywood Laminate plaque with laser engraved black brass plate, bright gold underlay. Available in 7 sizes. 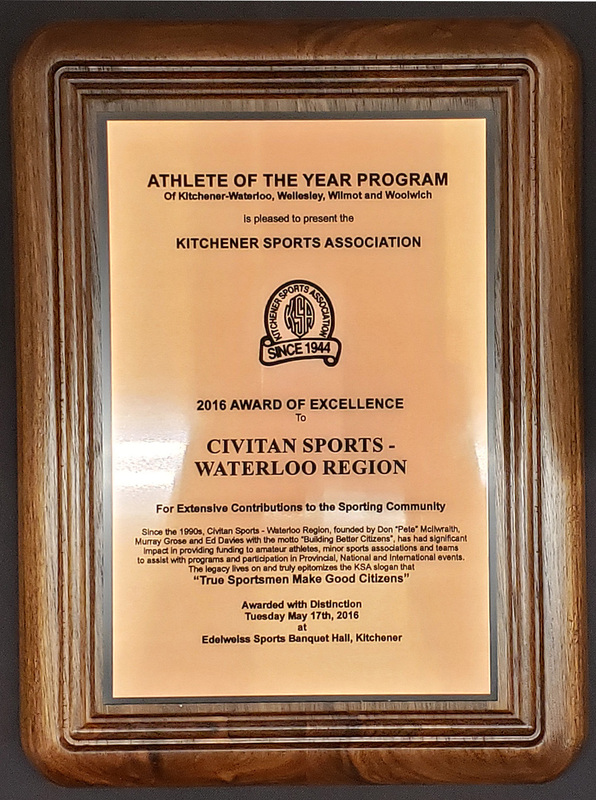 - 5 x 7" - 6 x 8", - 7 x 9" - 8 x 10", - 9 x 12", - 10.5 x 13" - 12 x 15"
Cherrywood laminate plaque with sublimated full colour graphics on brushed gold plate over bright gold OR black underlay. 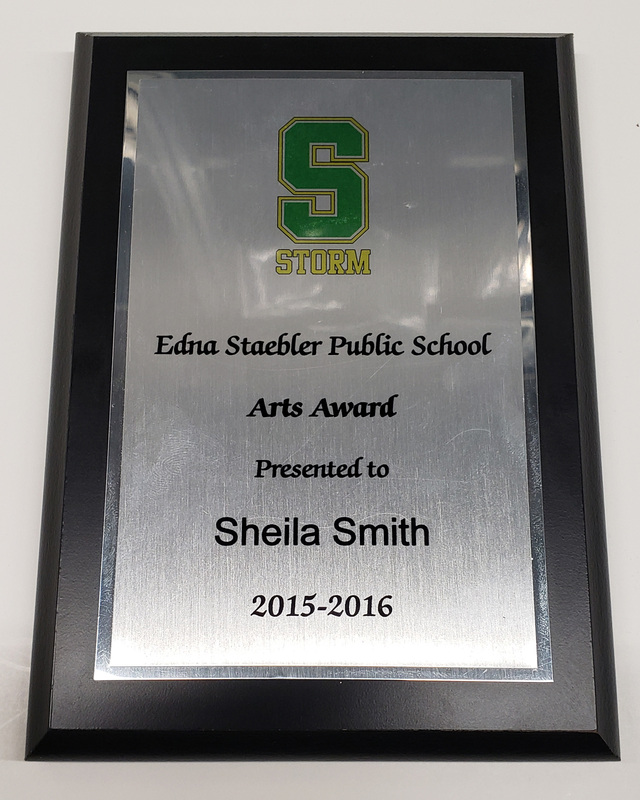 7x9", 8 x 10, 9 x 12" 10. x 13"
Black Laminated plaque with sublimated brushed silver plate over bright silver underlay. Allows for full colour graphics. 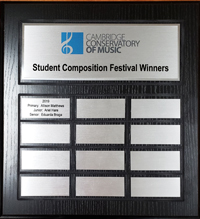 Sizes: 5 x 7", 7 x 9" , 8 x 10", 9 x 12"
Sample hardwood black piano finish plaque with brushed silver sublimated plate over bright silver underlay. Sublimation allows for full colour logos. 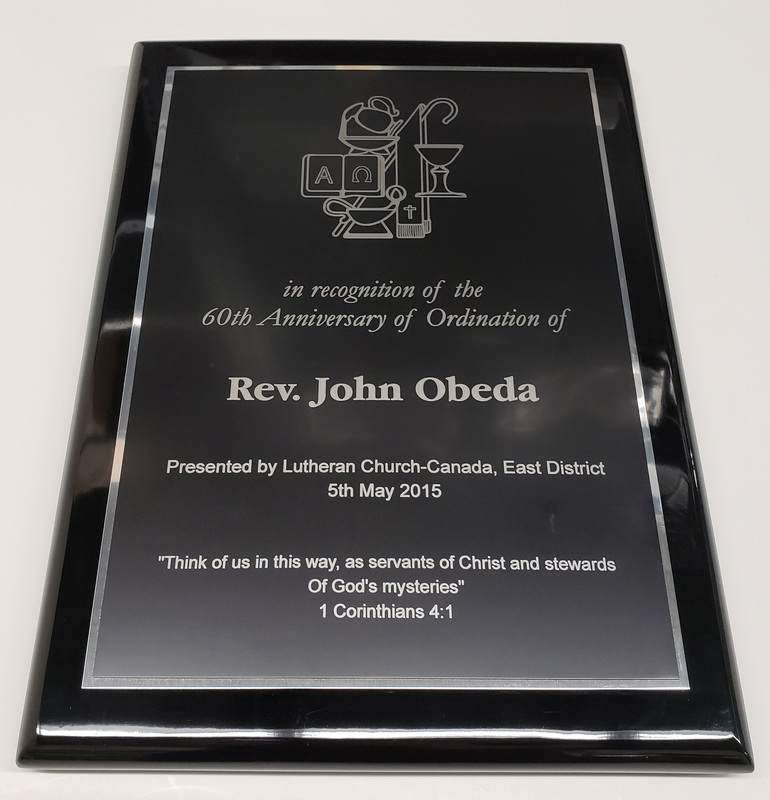 - Available sizes - 7 x 9" - 8 x 10" - 9 x 12 "
Black Piano Finish hardwood plaque with laser engraved matte black aluminum plate over bright silver underlay. Sizes 7 x 9", 8 x 10" , 9 x 12" and 11 x 15"
Solid Hardwood Piano Finish plaque with laser engraved Black Brass over bright gold underlay. Available in 4 sizes. - 7 x 9" - 8 x 10" - 9 x 12" - 10.5 x 13". 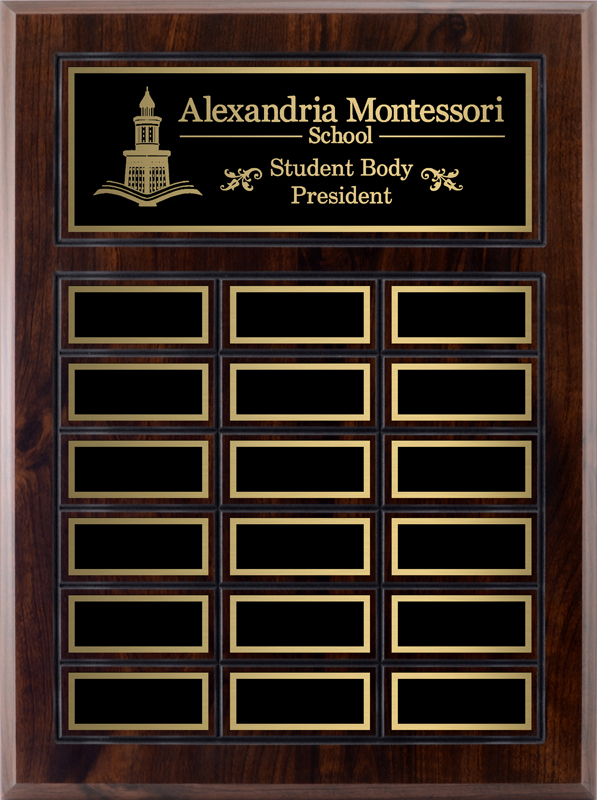 - 11 x 15"
T17-108300 - Hardwood Piano Finish Rosewood Plaque with laser engraved acrylic plate mounted to plaque. Available in several sizes: - 7 x 9 " - 8 x 10" and 9 x 12". Very stunning appearance. 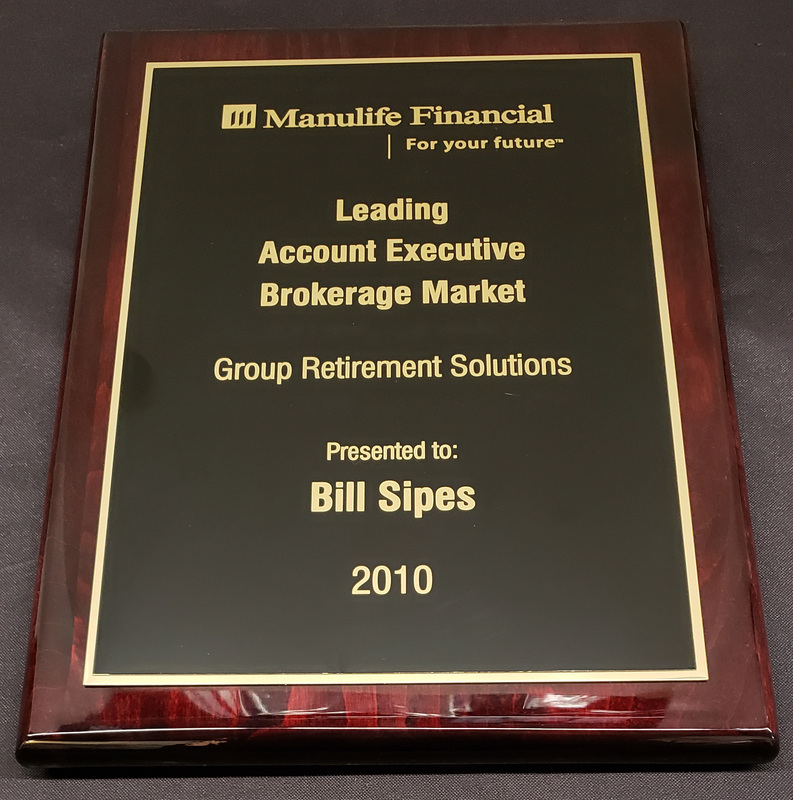 Solid Walnut Deep Groove plaques available in 7 x 9" and 9 x 12" sizes with laser engraved black brass over bright gold underlay. Solid Walnut Gallery Bevel plaque - 9 x 12" with laser engraved black brass over bright gold underlay. 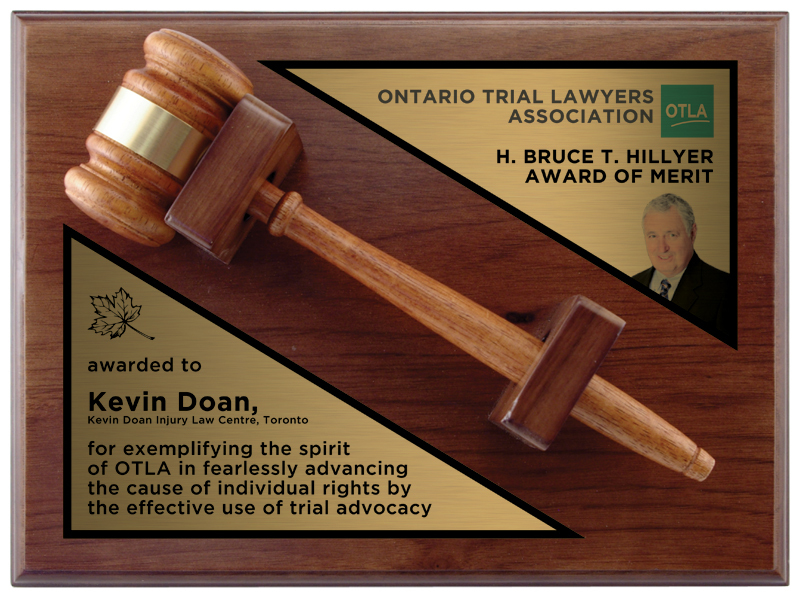 9 x 12" Solid Walnut Gavel plaque with gavel. With laser engraved black brass plates over bright gold underlay. 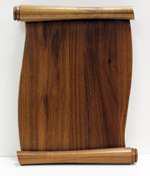 Solid Walnut Scroll plaques available in 7 x 9" and 9 x 12' sizes. Laser engraved black brass over gold underlay. #400W-CW - 10.5 x 13" Cherrywood laminate Certificate Holder - includes clear acrylic lens. 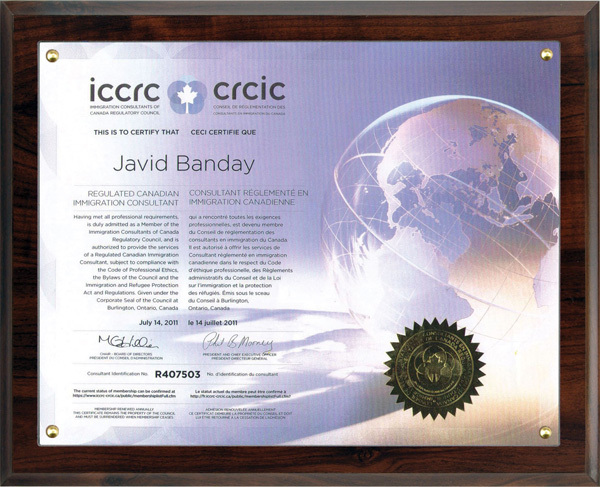 - Holds 8.5 x 11" certificate or photo - Vertical or Horizontal orientation. We mount it for you. 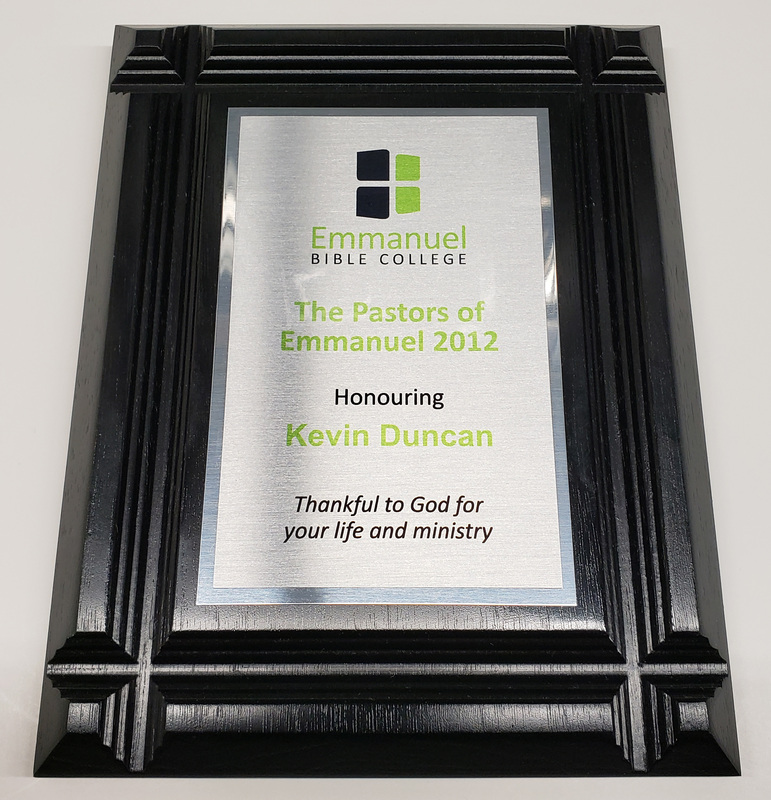 12 x 15" Black Laminated plaque - with brushed silver sublimated plate over bright silver underlay. - . 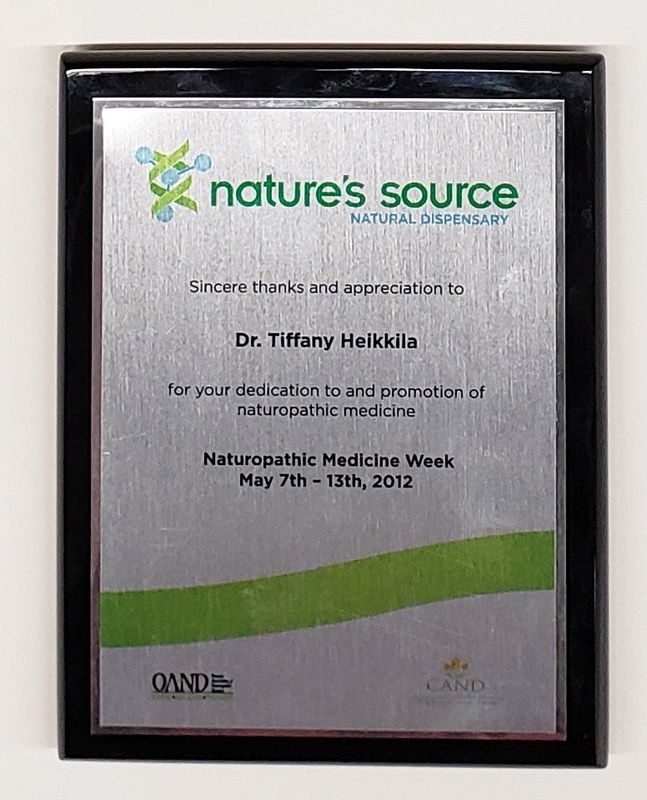 Can use full colour logos and custom layout for recipient plates. About $139.00 - Will Quote. Sublimated full colour graphics with text on brushed silver plate with bright silver underlay. 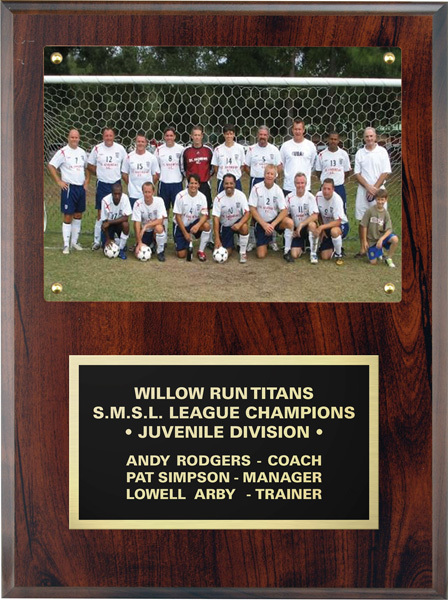 Sizes 7 x 9" or 9 x 12"
9 x 9" Black Granite laminate plaque - holds 5 x 7" team photo. - Email us your photo and we can print it and insert it here. Choice of Black Brass or Black Aluminum plate with gold or silver underlay. Price includes engraving and photo mounting. 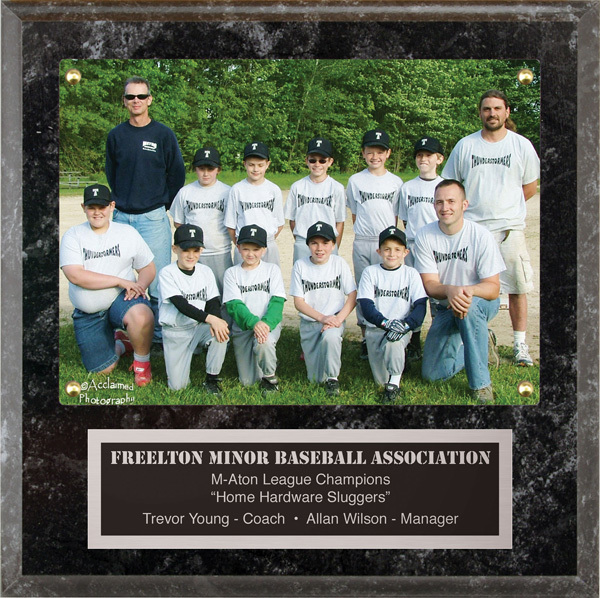 9 x 12" Cherrywood or Black laminate plaque - holds 5 x 7" team photo. - Email us your photo and we will print and mount it. Engraving plate is black brass over bright gold underlay. Other engraving plate colours available on request. Also available in Black laminate finish. Price includes engraving and photo mounting. Tiered pricing available starting at $55 for 1 piece with engraving included.